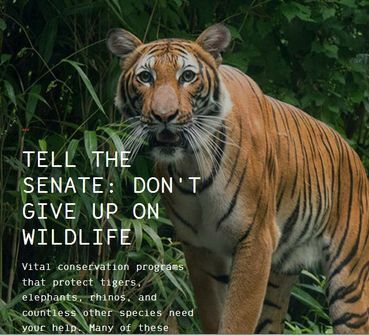 Thank you for speaking out on behalf of tigers, elephants, rhinos, and countless other species. Noted & signed, thank you! Thank you for speaking out on behalf of tigers, elephants, rhinos, and countless other species. Your voice is key in letting the Senate know that international conservation programs like the USAID Biodiversity Program, the Multinational Species Conservation Fund, combating wildlife trafficking programs at USAID and the U.S. State Department, and the Global Environment Facility are vital to the survival of these species and to tackling the most crucial environmental challenges we face."